Back in March earlier this year we received a text from two ladies in their 60's called Helen and Patricia. They had contacted us because they wanted our help to lose weight and get fit. Confident that we could help we headed up to Camborne to meet with them and have a chat. During our first meeting we talked at length about their current lifestyles, personal goals, expectations and also our holistic approach to health and fitness. At the end of that first consultation both Helen and Patricia committed to a full 12 week health, fitness and lifestyle program with 2 sessions per week. All sessions were to be delivered at Helen's home because they did not feel comfortable training in public, at our studio, the gym or outdoors. Both ladies were keen to get started and we booked them in for their first session later that week. Our first session consisted of some standard fitness tests and a general assessments and observations. Two things quickly became very clear. The first was that the two sisters were incredibly competitive with each other and secondly Patricia was suffering with back pain. Concerned about Patricia's condition we immediately began to adapt the session and we closely monitored her technique and movement. The first session went well, the energy was great and both ladies enjoyed the training. When we next met we took some time to talk about diet and nutrition. We discussed the basics and outlined our approach for weight loss and a healthy diet. Both ladies were given a food diary to record what, when and how much they were eating for the next 7 days. Food diaries aren't always effective and some people are very resistant to this approach but Helen in particular took to this approach well and provided a detailed account of her food intake for the week. We then analysed this and provided her with a simple healthy eating diet and nutrition plan introducing several subtle but key food switches for example brown rice instead of white rice. Over the next couple of weeks both ladies committed fully to the program but it was becoming clear that even with adaptations, corrective exercises and careful monitoring Patricia wasn't going to be able to continue. We agreed that we would work separately with Patricia to help her address the cause of her back pain and Helen would continue with the health, fitness and lifestyle program. It was disappointing that Helen and Patricia were unable to continue together but it was just too risky for Patricia. The first six weeks of training with Helen was focused on body weight HIIT style workouts and the results were amazing. HIIT workouts are great because they raise the metabolic rate which is fantastic for weight loss, they improve aerobic fitness, you don't need much equipment and they only take typically about 15 - 20 mins. Because they are short in length this gave us lots of extra time to address Helen's postural issues and to do this we applied the principles of Paul Chek's approach and Foundation Training. Over the course of the 12 weeks Helen's posture improved significantly and we even manged to address the cause of her shoulder pain and improve range of movement. By week 8 the combination of our healthy eating plan and regular training was really starting to pay off with visible weight loss and improved posture and muscle tone. It wasn't however just the physical changes that Helen was now experiencing it was her improved energy, mood and reduced stress levels. The program was impacting on various aspects of Helen's life in a very positive way! As we reached week 12 Helen was now getting really quite fit and her confidence was improving. Delighted with her progress Helen told us that she wanted to continue the training and after careful consideration we decided that It would be a good idea to put something in place to work towards. We ambitiously opted to commit to a 10K Freedom Racing trail running event near Porthtowan. I had heard good things about the Freedom Racing Events and after a bit of research we decided to set this as our new goal. We had 14 weeks to train and and get ready for the event. At this point running was not even part of Helen's program and we needed a new approach. We redesigned her training program, reviewed her diet and nutrition plan and began. Our first run was a gentle 1 mile jog on the trails near Helen's house and it became clear at that moment that this was going to be quite a challenge! Inspired and motivated Helen really started to focus on her training, diet and lifestyle. We incorporated independent training sessions to up her sessions from 2 to 3 - 4 per week and within six weeks Helen's fitness went to the next level. We were now running 5 - 6K twice per week on the flat and at a steady pace. Speed and time was never a focus, just completing the race would be a massive achievement. Over this period Helen's transformation really started to become noticeable. She had now lost two dress sizes and she was feeling energised and confident. A landmark session was a 9K run that we did between Marazion and Penzance one evening (pictured below) about 4 weeks before the event. 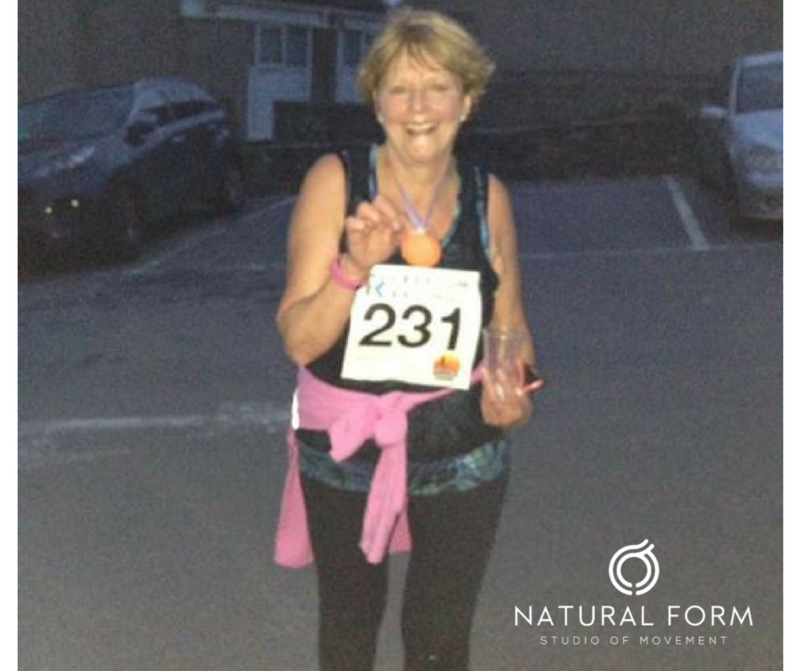 It was after this event that Helen really began to appreciate her journey and she was now looking forward to the 10K event at the end of the month. 9K Run from Marazion to Penzance and back! The training continued to go well right up until the last moment. We had now done several good runs on coastal paths and trails with hilly sections and we were confident that Helen was now ready. On the day of the event you could tell that Helen was nervous. This was after all a genuine running event and there were clearly some serious runners competing. The atmosphere before the race started was a little bit tense but we tried our best to stay clam and to enjoy the moment. When the race started we were greeted with a near vertical hill climb which set the tone. It was going to be a tough race! I immediately began to wish that I had chosen a less challenging course for Helen's first ever event. That said we were committed now and we would just have to dig deep and get on with it, something that Helen is excellent at! The first half of the course was quite brutal with some serious hill sections and Helen found it quite hard. The view from St Agnes Beacon - Freedom Racing with Helen Wilson! At the halfway point we climbed to St Agnes beacon and the view was breathtaking. It was a lovely evening, with minimal wind and from this elevated position it was great to see just how far we had come. The great news was that from this point on it appeared to be pretty much all downhill. The section along the coast before Chapel Porth was absolutely stunning and by this point we were really starting to enjoy the race. We finished the race together and we were greeted by the Freedom Racing event team who I have to say were incredibly supportive and friendly. Helen's son was waiting at the finish line and I was a fantastic and very proud moment to cross the finish line with Helen. We took a few minutes immediately after finishing to appreciate what Helen had just achieved and her journey over the past six months. We had a drink of water, a quick photo and it wasn't long before Helen started talking about what her next challenge should be! We have since planned to start training again after Helen's holiday but we've yet to decide what will be our next goal. The Freedom Racing Event was so well organised and enjoyable I think it is likely that we will enter a few of the other 10K events next year. Helen's daughter has also decided that she would like to start training and running with us as well. Patricia has continued working with us to resolve her lower back pain issues and sciatica. She has made some good progress but it will most likely be some time before she is able to participate in training sessions with Helen. Hopefully in time we will get them back together training again. Inspired? Find out more . . . .
You can find out more about Freedom Racing by visiting their website here. We are currently offering a free consultation and free first session with no obligation to sign up to our full program so get in touch today, we'd love to hear from you.